Having termite problems? We can help. Our loyalty lies with you, our clients ... AND we are not paid commissions on termite control services SOLD like the "Big Boy" companies. Termite Control CT. Subterranean termites are the the kind of termite encountered throughout Connecticut. Although they nest in soil, subterranean termites can attack structures by building tubes that connect their nest to wood in structures. Aerial nests can occur without a ground connection if all castes of the colony are present and moisture is available. Subterranean termites are social insects that live in colonies consisting of many individuals. The colonies are composed of workers, soldiers and reproductives (Figure 2 ). CREDITS: University of Florida Figure 2. Castes of termite from top left, right and bottom; worker, soldier, and winged reproductive. The workers, which are about 1/8 inch long, have no wings, are white to cream colored and very numerous. Soldiers defend the colony against insects, like ants, that can attack the colony. Soldiers are wingless and white in color with large brown heads and mandibles (jaws). King and queen termites perform the reproductive functions of the colony. They are dark brown to black in color and have two pairs of wings about twice the length of their body. Termites in CT remain hidden within wood and are often difficult to detect. However, subterranean termites may be detected by the presence of winged reproductives, mud tubes, and wood damage. Winged reproductives ( Figure 4 ) emerge from colonies in great numbers usually in the spring and during the daylight hours. 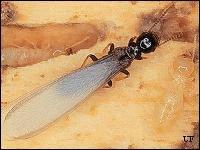 Usually termites are first noticed by the presence of winged reproductives. Mating occurs during these flights, and males and females form new colonies. Winged termites can be distinguished from flying ants by their thick-waist, straight antennae and wings of equal size. Termites have thick waists, straight antennae, and wings of equal size. Large numbers of winged termites in a house are an indication of probable infestation. Termite wings break off shortly after their flight, and even though the actual swarming is not observed, the presence of discarded wings indicate that a colony is nearby. Because termites are attracted to light, their broken-off wings are often near doors or windows where the termites have been attracted to the light. The peak swarming period for subterranean termites in the Connecticut area is in the spring. Subterranean termites in CT build earthen, shelter tubes to protect them from low humidity and predation. These tubes are usually 1/4 to 1 inch wide. Houses should be inspected at least once a year for evidence of tubes. If the house has a crawl space, the inside and outside of foundations should be inspected for tubes. If the house has a concrete slab floor, cracks in concrete floors and places where pipes and utilities go through the slab should be closely examined. Cracks in concrete foundations and open voids in concrete block foundations are also hidden avenues of entry. Wood damaged by subterranean termites in CT is often not noticed because the exterior surface usually must be removed to see the damage. However, galleries can be detected by tapping the wood every few inches with the handle of a screwdriver. Damaged wood sounds hollow, and the screwdriver may even break through into the galleries. Ventilation openings in foundations should be designed to prevent dead air pockets and of sufficient size to assure frequent changes of air -- at least 2 sq. ft. to 25 running feet of outside foundation wall. This helps keep the ground dry and unfavorable for termites. Subterranean termites are controlled by preventing the termite colony in the soil from entering the structure. It is impossible to build structures so termites can not cause damage. Therefore, a thorough preconstruction treatment should be applied to protect the structure for at least 5 years. Houses treated prior to 1988 with chlorinated hydrocarbons, such as chlordane or heptachlor, should be protected from termites for 30-40 years. There are two general categories of termiticides that are differentiated by how termite tunneling is affected when they encounter an effective soil treatment. The first category is referred to as a, "Repellent Termiticide." All of the synthetic chemicals classified as "Repellent Termiticides" are pyrethroids. The name "Repellent Termiticide," is ambiguous; the chemical properties of the soil treatment only repel termites from the structure. "Repellent Termiticides" do not kill termites because they are able to detect the soil treatment. Since the termites are able to detect the treated soil they do not tunnel into the treated soil barrier. The other category is referred to as a "Non-Repellent Termiticide." Termite tunneling is not affected by a "Non-Repellent Termiticide" soil treatment because the termites are unable to detect the treated soil. Since they continue to tunnel freely through the treated soil they become exposed to the "Non Repellent Termiticide" by contact or ingestion and will die. Both repellent and non-repellent termiticides have proven satisfactory for making effective barriers when applied properly. The integrity of the soil treatment is a key factor in providing protection to the structure. A repellent termiticide properly applied to the soil will provide protection to the structure unless the barrier is disturbed. A termiticide barrier composed of a non-repellent termiticide allows more flexibility and will provide protection even if the integrity of the barrier is disturbed. CT Termite baits use small amounts of insecticide to knock out populations of termites foraging in and around the structure. Some baits may even eradicate entire termite colonies. Termite baits consist of paper, cardboard, or other termite food, combined with a slow-acting substance lethal to termites. Regardless of which bait is used, the customer must be prepared and willing to accept the possibility of a lengthy baiting process. Some bait products are inserted below ground out in the yard, whereas others are installed above ground level on the inside of the structure. Baits are applied below ground by enticing termites to feed on wooden stakes, cardboard, or some other cellulose-based material. The toxicant-laced bait can either be installed initially, or substituted after termites have been detected in an untreated monitoring device. The more below ground baits installed, the better the chances of locating termites. Planning, patience, and persistence are requisites for successfully using below-ground termite baits. Termite baits may also be installed above ground in known areas of termite activity. Typically, the stations are installed directly in the path of active termite tunnels after the mud tubes have been broken. Effects tend to be more rapid with above-ground baiting because the procedure does not depend upon "chance" termite encounters with the stations. Call to schedule your termite control CT appointment today 888-558-1574.